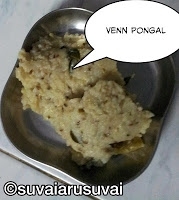 How to prepare Ven Pongal the way it is prepared in hotels and restaurants? In a pan fry moong dal and rice separately till they become golden in colour. Wash them separately then mix them together. The total quantity of rice and dal is equal to 1 1/2 cups. Add 4 cups of water and pressure cook rice and moong dal together. When done remove and add salt. Chop the ginger to fine pieces. Slit green chillies into two halves without cutting it fully. Grind black pepper and cumin seeds coarsely. Add ginger, green chillies, pepper and cumin powder and asafodeita to the cooked rice. In a frying laddle, add 1/2 of the ghee and fry the cashew nuts till they become golden brown. Cut the curry leaves into small pieces and spread on top of the Ven Pongal. Pour the fried cashew nut along with ghee on top of the curry leaves. Heat the remaining ghee and pour it too. Mix everything thoroughly. Adjust the salt if needed. The best side dish for Venpongal is Coconut Chutney and Tomato Gojju or Brinjal Gotsu.